Myra Anson Nicholas will be giving weekend and evening workshops in web design and mixed media crafts. Workshops begin April 2011 and are offered through The Workhouse Arts Center in Northern Virginia. New and exciting Web Design courses for artists are offered at multiple times of the day. Hosting and software are included in the fee. Fun and funky Mixed Media Jewelry Workshops include "Creating Unique Pins & Pendants From Old Jewelry" and "Making a Pearl-Framed Sunface. 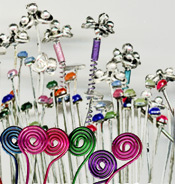 Give your handcrafted jewelry a special look with our unique assortment of headpins. All headpins are closely priced so you can mix and match for best value. Quantities are limited, so please inquire before you order if you have specific needs. See the entire grouping! We've gathered one-of-a-kind beads, charms and jewelry bits from the 40's to the 70's for you to assemble into a pin, pendant or necklace. We call it the Vintage Treasure Kit and in the portrait above we've used a ring, a clip earring and piece of thinestone necklace as the 3 different filigree centers. Kit includes everything you'll need to make one. Get one today! 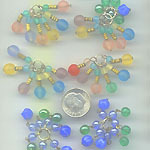 Wonderfully unique vintage flower beads are perfect for everything from jewelry and accessories to dolls, altered arts projects and mixed media fun! 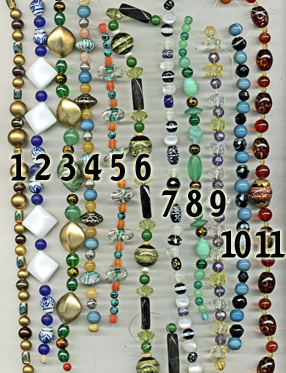 Bead bunches are sold just as they come... wired or wrapped together, used as fringe edging or tassels , (most are glass) 3 bunches for $8, our funky plastic beads with gold spots - $4 ea. 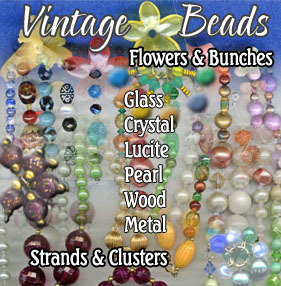 VINTAGE STRANDS, JEWELRY AND "PARTZ"!! 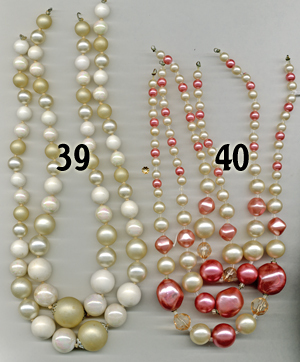 These are $4.50 per strand. 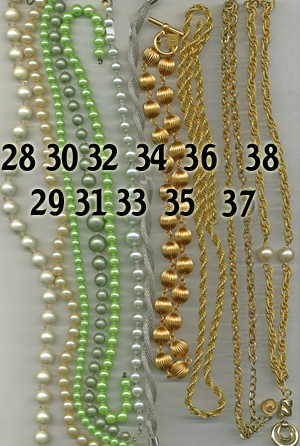 These are $5.50 per strand. 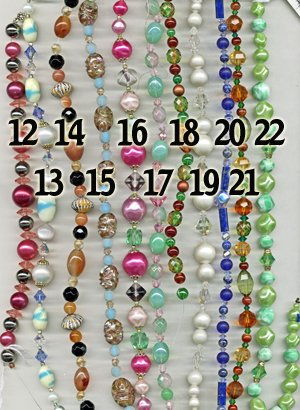 These are $6.00 per strand. 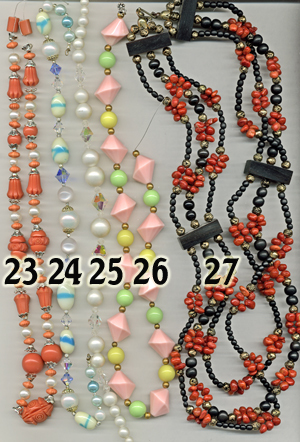 These are $3.50 per strand. These are $8 per set. 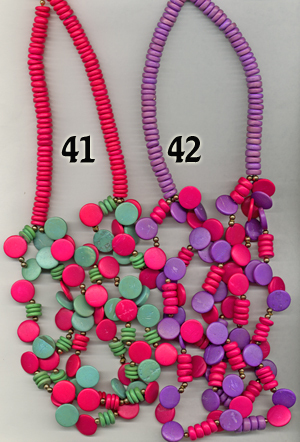 These are $5.00 per necklace. 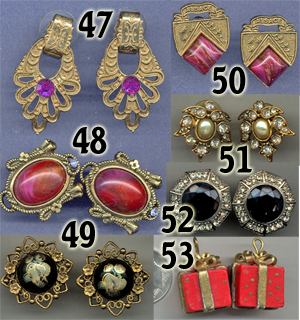 Vintage earrings $10 per pair. 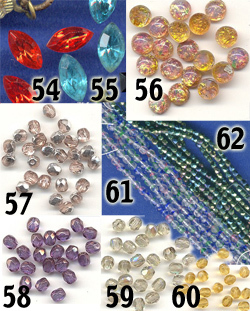 57-62: 4-5mm Vintage Czech Fire Polished Glass Beads $5/pkg (25).